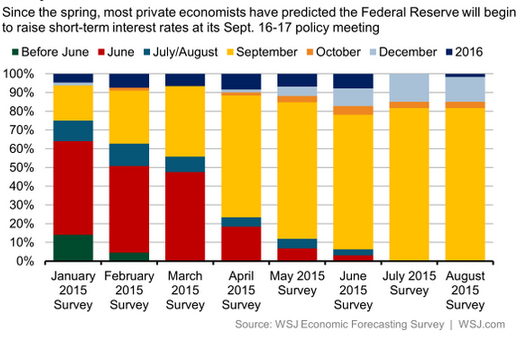 The majority of economists still expect the Federal Reserve to begin the long-awaited liftoff next month. However is this dovish FOMC truly prepared to "pull the trigger" this time? Here are some reasons the central bank is likely to delay the first hike. 1. While the Fed officially talks about not being focused on the currency markets, the recent dollar rally should give them some food for thought. The global "currency wars" have sent the trade-weighted US dollar to the highest levels in over a decade. This will continue to put pressure on US manufacturing (and even some services sectors) as US labor and other costs of production rise relative to other nations. 2. 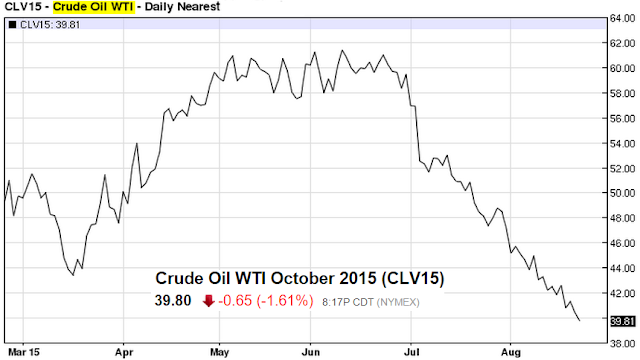 Commodity prices, led by crude oil and industrial metals, hit new multi-year lows, reigniting disinflationary pressures. 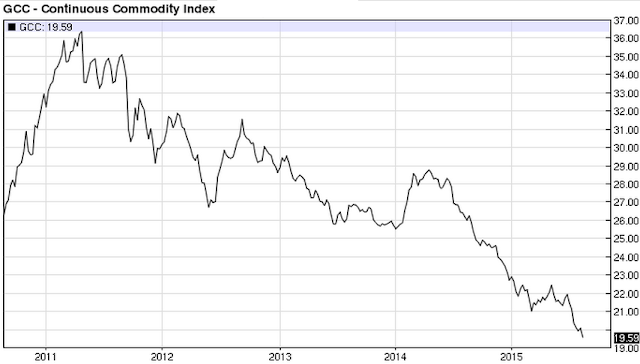 Note that the Bloomberg Commodity Index is at the lowest level since 2002. Some at the Fed continue to view this as "transient", but the full impact of such a move is yet to be fully felt in the economy. Here is a broad commodities index. In fact as of Sunday night in NY, WTI futures are trading below $40/bbl. 3. 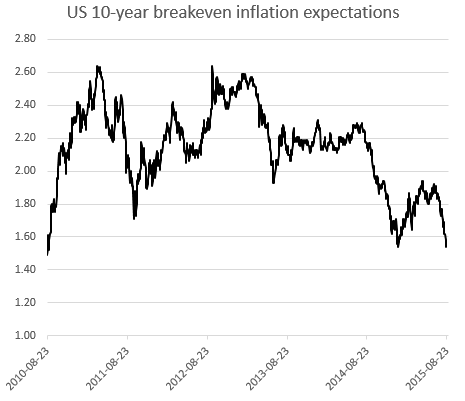 Driven to a large extent by commodity prices as well as economic weakness in China, US breakeven inflation expectations are declining sharply as well. Does this look like a great environment to begin raising rates? 4. Some point to the recent stability in "core inflation", with CPI ex food and energy remaining around 1.8% and providing support for a less accommodative policy. However the main driver of this stability is the rising cost of shelter. 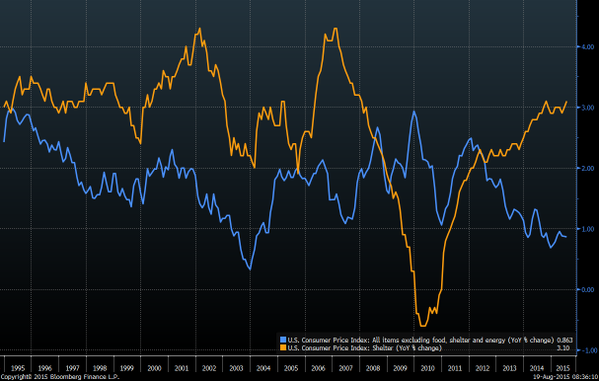 Core CPI excluding shelter is below 1% (YoY). 5. The biggest argument for a rate hike is the expectation of increasing wage pressures. US labor markets continue to improve and at some point - the argument goes - wage growth will accelerate. However, we haven't seen much evidence for wage pressures thus far, as average hourly earnings continue to grow by about 2% per year (nominal). With the recent dollar strength, US corporations will speed up shifting production abroad - especially Mexico, limiting wage growth in the United States. Moreover, rising rental costs are squeezing US households - many of whom are being priced out of the rental markets or can not keep up with increasing shelter-related expenses (chart below). The FOMC has to ask itself whether a rate hike will help the situation. The answer may be just the opposite: higher rates may put more upward pressure on rents as the cost of financing rental properties increases or construction of new rental housing slows. 6. Finally some at the Fed have been concerned about bubbles forming in the financial markets. In recent weeks however, the markets took care of that, as a healthy dose of risk aversion returns to the markets (see post).